Iraqi and Sudanese cooking classes as well! At Veena’s Market, we love so many cuisines! I just shared the South Indian cooking class in a previous post. Here are two more really cool opportunities! Project Feast’s pilot training sessions have been in full swing these last two months. We have a Burmese group that started a month ago, and a Middle Eastern group that is almost done training. We also have a large group that will start training at the King County Housing Authority’s Greenbridge Center next week. Exciting times! Recently, we taught cooking class facilitation skills to a Middle Eastern group in partnership with the Lutheran Community Services Northwest. Brian Donkersley, a volunteer with Project Feast, attended and took these pictures below. Some of the women who completed the training, will be teaching cooking classes! Rana and Sundus, both from Iraq will be teaching a class together on July 13th, Saturday from 11:30-2:30, also at Lutheran Community Services Center. Their initial menu had 10 dishes on it and we really had to work with them to bring it down to 6! We will be learning how to make chicken beryani, maqluban (a dish with cauliflower and chicken), oat soup, date halawa, vegetarian salad and nabulsi kunafa, a dessert with cheese. Tickets are $35 each and can be purchased here. Rehab, a soft spoken lady from Sudan, has designed a menu with many middle eastern favorites such as falafel and hummus. There will also be Sudanese chicken and rice, chickpea salad, and a Sudanese dessert called kunafa. We are offering her Sudanese cooking class to the public on July 9th (postponed to July 23rd from 6-9pm where you will not only learn Rehab’s recipes but also get to eat as a group. This class will be at the open kitchen at the Lutheran Community Services Center. Tickets are $35 each and can be purchased here. Announcing a South Indian cooking class! It’s been a bit quiet around Veena’s Market…this is because I’ve taken a break to start up a nonprofit called Project Feast. We work with refugees and immigrants in the Seattle area, offer basic training that helps them find jobs in the food industry. This is one of the hardest and most fulfilling “jobs” I’ve ever had. We’re a long way from being fully established but working really hard to make a difference and show strong results from the beginning. As part of our work at Project Feast, we like to offer cooking classes and events where we can help provide exposure to the refugee and immigrant community and create opportunities for interaction with the broader Seattle community. These events also help us generate a small amount of revenue to support our training programs. Since I can teach Indian cooking classes, I’m doing my bit too! Next week, I’ll be offering a Dosa making extravaganza at the Fremont Abbey. We will be making the popular Masala Dosas with a curried potato filling as well as Kheema Dosas that are stuffed with curried ground meat. We will have the South Indian lentil curry called Sambhar as well as a couple of chutneys as accompaniments. You will leave with recipes as well as some of the ingredients so you can repeat the dishes at home. Tickets are $55 and the classes will be held at the downstairs kitchen at the Fremont Abbey in Seattle. For more information and to buy tickets. It’s been a while since my last post! I’ve been REALLY busy getting an exciting nonprofit venture off the ground. This is a social enterprise called Project Feast that provides training and opportunities to refugees and immigrants in the food industry. It shouldn’t be surprising that this startup too is all about food! We’ve been very focused so far on working with Burmese cooks. This is a cuisine that Veena’s Market customers are bound to love. Much like India, Burma has a lot of diversity in religion, ethnicity, and food. The Seattle area has become home for many people from the various communities of Burma with a lot of diversity in religion, language and cuisine. While the Burmese cuisine is influenced by that of its neighbors – India, China and Thailand – its flavors are unique, fresh and delicious. I get many requests for cooking classes. I wanted to share a unique opportunity with Seattle area readers of this blog. Project Feast is offering a unique cooking class in partnership with Crooked Trails on March 16th. Come taste the flavors of Burma at a hands-on cooking class. Our class will be taught by Annie P from the Karen community of Burma through a translator. 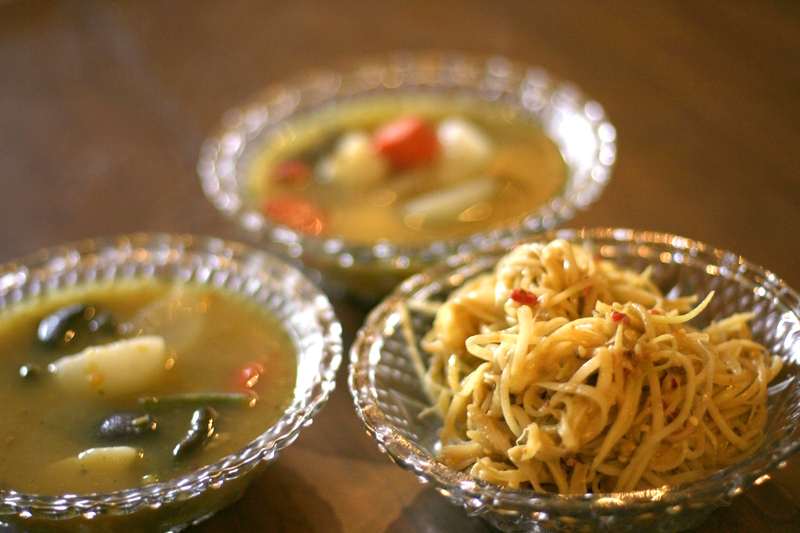 We will be featuring a family style menu reminiscent of how most Burmese, and how Annie’s family eat at home. There will be a mix of hot and cold, spicy and mild, dishes served with rice. We will make a flavorful curried chicken dish, a mix and match salad bar, rice, along with fresh herbs and raw vegetables on the side. In addition, we’ll have sweet treats to munch on while cooking. We will be doing a wine tasting with Masquerade Wines before we get started cooking. 10% of wine sales will benefit Crooked Trails. There are a couple of spots left. To reserve your spot , please email chris@crookedtrails.org AND purchase a ticket at the link. The Mustard Oil Controversy: An Oil for Cooking or for Massage Only? Enter your email address to subscribe to this blog and receive notifications of new posts by email. This will not subscribe you to the Veena's Market Newsletter. All content (text, recipes and images) on this blog page is fully owned and copyrighted by Veena's Market, 2010-2011. Recipes can be used with prior permission and proper attribution. Blog photography by Veena Prasad unless otherwise attributed.